Hey Mr. President and Congress — readers believe in you! 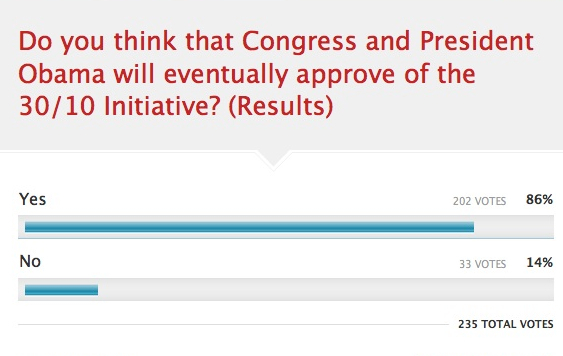 I posted a poll recently asking readers their opinion of whether the 30/10 Initiative would pass muster with Congress. Seemed like a reasonable enough question. The 30/10 plan proposes to build 12 transit projects funded by the Measure R sales tax increase in the next decade by securing federal loans and other financing. Elements of the 30/10 will likely require law to be written and, as you know, Congress and President Obama are the deciders when it comes to writing law. Given the steady stream of not-always positive media about Congress, I have to say the results of the poll surprised me — that readers were lopsided in their view that the folks in distant Washington D.C. would see the merits of the 30/10. I think that Congress will realize that Mass Transit projects around the nation not only create jobs but also are greener and move more people around major urban centers. Boston, Chicago, Los Angeles, New York, Philadelphia, and San Francisco just a few communities that need to continue to build and work on Mass Transit. Smaller Cities need to manage their transit needs with Light rail & Trolleys too. Lets write our Congress and let them know that we must continue to invest in American Infrastructure and a more greener society- Mass Transit. Not a bad idea — writing Congress. In fact, here’s a recent post listing the addresses and websites for all the members of Los Angeles County’s congressional delegation for attentive readers who like to fire off emails and letters to their elected representatives. And while I’m at it, here’s an offer: If you write Congress or the White House and get an interesting response, pass it along to The Source and we’ll post it. Our email is thesource@metro.net.